For months now, I have been trying to think about how to word this post, and each time I was left unsatisfied and decided to return at a later date. Now, time has worn on and, however apoeticaly, I have decided it has been long enough. The process of creating stems deeper than the simple transformation of materials into other objects; the heart and soul of the maker is poured into it. Limited time and space led to my limited ability to work, but those things I was able to work on held their own special meaning. 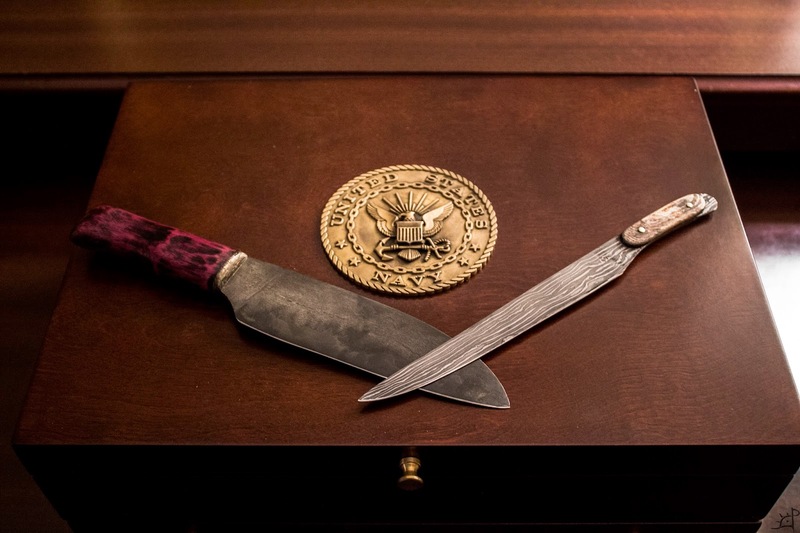 In the interest of preservation and reclamation of materials, I set forward to forge a pair of knives that would go to two of my good friends at their wedding. For as long as anyone can remember, they had been together, and since I met them, acted as though they were already married. Such relations are rare to come by, and when they happen across you, you can but stand aside and watch. I have been to a number of weddings, but I can say with all truth to it that this was the most beautiful weekend I have ever seen. Without trying to exaggerate the days we had leading up to, including, and following the ceremony, everything was virtually perfect. 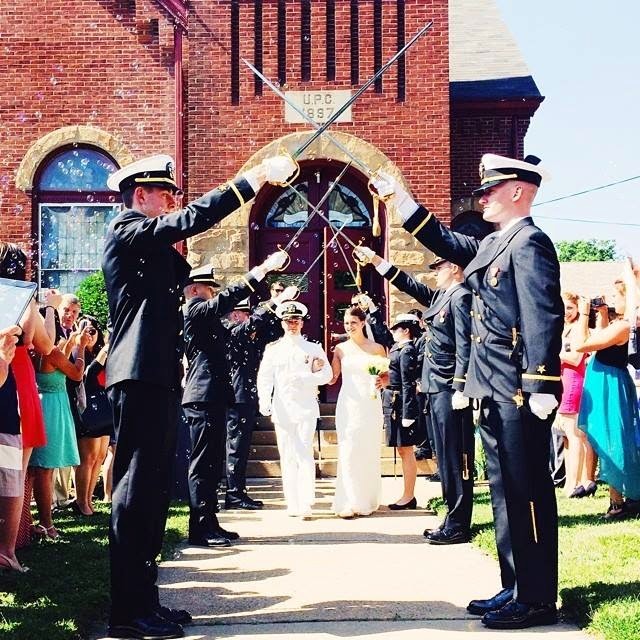 There ran a deeper sense of friendship and commitment not only between the husband and bride, but also between them and the group of friends they developed. In my ignorant youth I failed to understand that it is the people in life that make the most significant difference. How wrong I have never been. Come next week, I will be moving down south where my own path has led me, and from there to wherever the winds blow. To my friends, Fair Winds and Following Seas, and may we meet again soon. For those who care, I will also write a little about the knives I made to accompany them through the ides of life. The first of the pair began as a laminated chopping knife where the other layers were given to me in the form of an old architectural spike from another friend of ours. 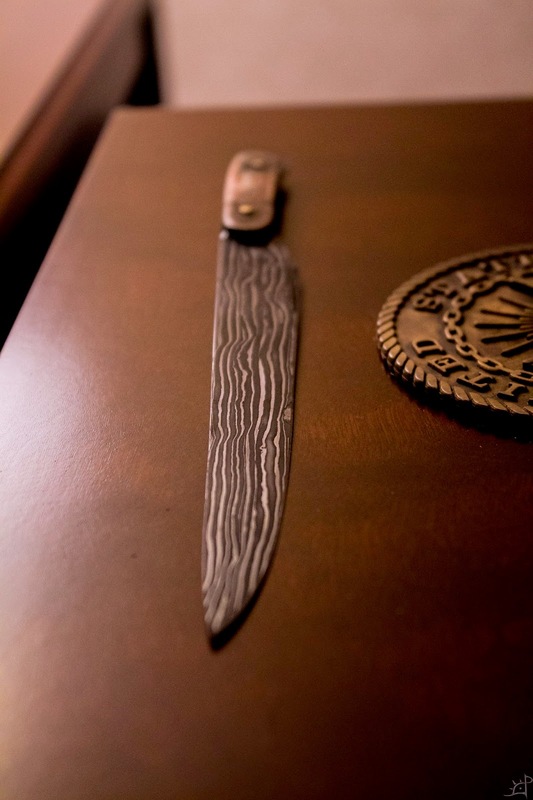 As the blade took shape, an interesting emerged from the old steel, akin to wrought iron. 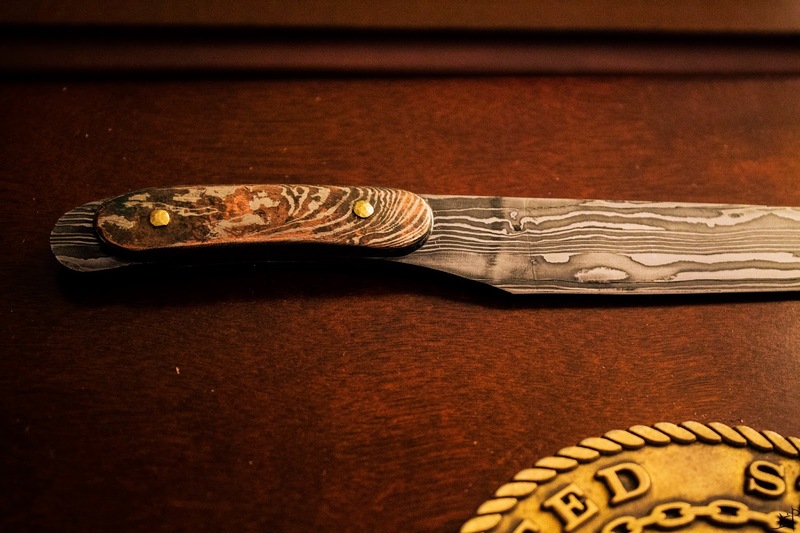 The second of the two was intended to be an opposing twist pattern welded steak knife. Long into its creation, the steel refused to behave and instead of holding to its design, the layers smoothed into a straight laminate. Labouring in the hour hours of the summer, I drew on the foundation of my limited experience and pushed the boundaries of my skill as a craftsman. 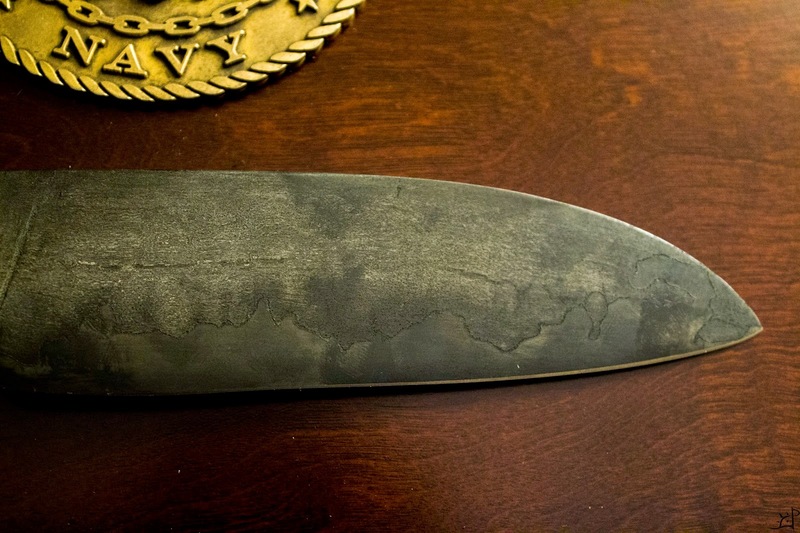 The technical level of the knives, although much better than the other blades I have made, are not without their faults. On each, I used a piece of mokume gane from years past, the bolster of the chopper and the handle of the other. 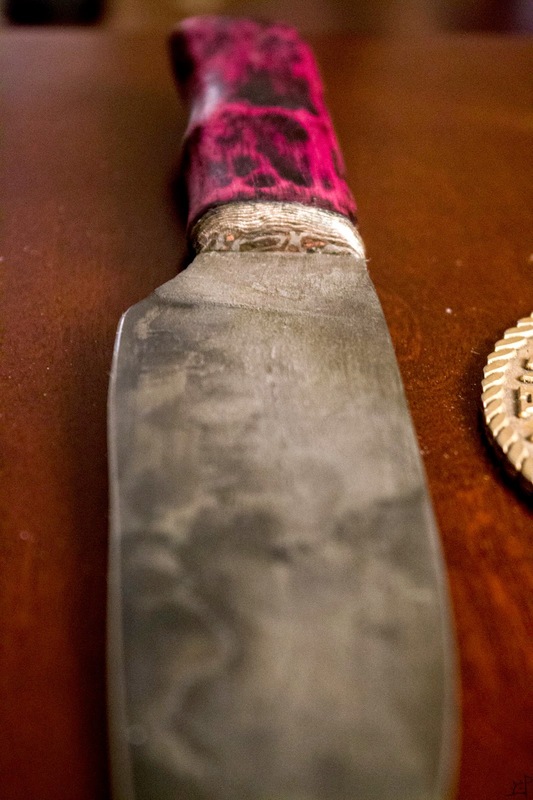 The remainder of the handle of the chopper is purple heart, burnished in places to darken it while the remainder will turn with age. With each new knife, there come with it a number of new techniques practised. One of the products of finishing a tenth the knifes I forge is that the finishing is the hardest part. The chopper is the first hidden tang knife I ever handled, as well as the first I have ever bolstered. The plunge cut, although a bit off, is also the first I have done, and turned out better than I thought. Similarly, the laminate and the pattern weld are the first I have successfully finished, all others being mon-steel construction. As my journeys through life take me elsewhere, I will hold to my roots and carry on in this path of craftsmanship, and in it the hopes of bringing the process to others.